A production line is a sequence of tasks (or operations) done in a factory. The tasks process materials to make a useful product. 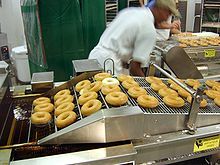 An example is an assembly line, used in manufacturing. Production lines were introduced with the development of the steam engine. It depended less on the power source. Wikimedia Commons has media related to Production lines. This page was last changed on 24 October 2016, at 19:34.